A little about Ryeson: Ryeson lives with his guardian family in Paso Robles. They say, “Ryeson enjoys his early morning walks and loves to greet everyone he meets along the way. He’s very affectionate with his human and fur family members. He has brought a lot of joy to his guardian family who loves to watch him run and leap around the backyard at top speed. His coat is super fluffy and he loves to snuggle. Ryeson has a very gentle demeanor paired with a healthy zest for life. He’s truly made our family complete.” *Ryeson is available for stud service to approved, health-tested females. A little about Waylon: Waylon lives with his guardian home in Paso Robles. They say, “We are so grateful to have Waylon as part of our family. He is a sweet, gentle, attentive boy, who loves to snuggle, but also plays hard! He especially loves playing with other dogs, and is always tagging along with his big brother, Revan. Waylon has been a great addition for us!” *Waylon is available for stud service to approved, health-tested females. A little about Winston: Winston is one of the most athletic dogs you will ever meet, according to his adoring guardian family. He loves water, playing on the beach and chasing seagulls! He is friendly and happy-go-lucky; his guardian family has been told numerous times by friends how much they would love to have a dog with the same temperament as Winston! Winston is a true medium-sized bundle of affection and love. Winston is available for stud service to approved, health-tested females. A little about Boone: Boone is a sweetheart, and a handsome guy to boot. What more can a guy want than good looks and a temperament to match?! Boone lives with an adoring guardian family. They say he is the "sweetest, most affectionate boy you could ever meet, and he would spend all day snuggling in our laps if we let him!" They add, "He is gentle and patient with our three young sons, and he enjoys socializing with his other dog friends. Boone is incredibly loyal, a fast learner, and is both obedient and smart." Boone is available for stud service to approved, health-tested females. A little about Oliver: Oliver's guardian home says, "Ollie loves people and other animals. He shares our home with his brother, Kevin, and 4 cats and of course his humans (who he loves!). Ollie is very loving and likes to be wherever we are- a faithful companion. Ollie loves his many toys. His favorite thing to do is drag them all out of their basket one by one. He is affectionate and good natured. He has been the perfect addition to our family!" Oliver is available for stud service to approved breeding programs with fully health-tested females. A little about Riggs: Riggs' guardian home says, "Riggs wants to be wherever the action is! He loves to wrestle with the kids or run around with other dogs. He also loves us very much and wants to cuddle up to us or just take a nap at our feet. He has a sweet, teachable spirit and has been a great addition to our family!" Riggs is available for stud service to approved breeding programs with fully health-tested females. A little about Maverick: Maverick is the most gorgeous standard poodle we have ever seen! We feel so blessed to have this stunning guy in our breeding program. He is an AKC standard poodle, in the rare "tuxedo" parti coloring. He is a deep, crimson red with white markings. His loving guardian family lives in San Luis Obispo, and everywhere they go they get comments on his stunning good looks! They say he is very athletic but cuddles like a teddy bear. Maverick is not a barker and has an easy-going temperament. He loves other dogs, but his best buddy is his "brother" Stryker, a 3-legged rescue cat. Maverick is available for stud service to approved breeding programs with fully health-tested females. A little about Murphy: Murphy carries the parti gene, meaning he can produce the popular two-toned parti puppies. He lives in a loving guardian home in Paso Robles, who say, "Murphy knows no strangers and is friendly with people as well as other dogs. He is both a lover and a cuddler. He is calm yet playful, and he loves to play catch and run in the yard." Murphy is available for stud service to health-tested females from approved breeding programs. A little about Buster: Buster's Guardian Home says, "Buster is a well-loved member of our family! He is such a sweet dog and loves to cuddle up next to us. His favorite activity is to go on long walks with us- he even knows its time to go for a walk when we start to look for his leash!" Buster is a wonderful companion for an older couple. He absolutely loves his family. Buster is available for stud service to health-tested females from approved breeding programs. A little about Cosmo: Homegrown here at Gail's Doodles, we couldn't be more pleased with this handsome boy in every way. Cosmo has it all -- striking good looks with his coloring and coat (that is of course non-shedding and allergy-friendly), the perfect size, nice body conformation, as well as a fabulous disposition -- friendly, loving, confident and loyal! Cosmo can easily produce puppies of any size, depending on the size girlfriend he is paired with. And what young dam wouldn't drool over the opportunity to be paired with this dreamy stud muffin?!! 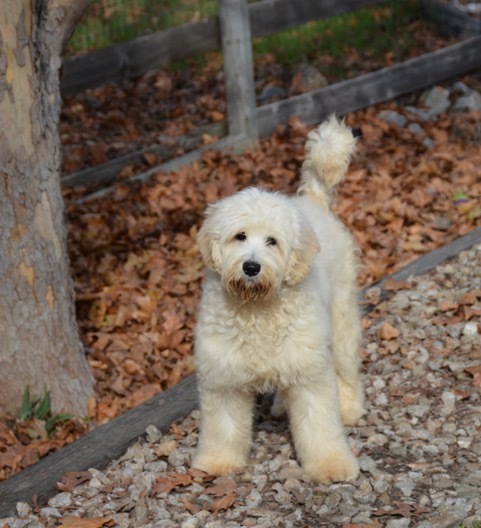 Cosmo lives with an adoring Guardian family in Paso Robles, and because of their wonderful experience with Cosmo the past two years, they plan to add a second goldendoodle to their family soon! Cosmo is available for stud service to health-tested females from approved breeding programs. A little about Jack: Say hello to Jack, our lovable and handsome Medium Multi-gen Goldendoodle. Jack lives with his guardian family in San Luis Obispo, who has this to say about him: “Jack is a lover! He enjoys cuddling on a welcoming lap, playing with other dogs and playing with children. He is confident, very smart, and he's extremely fast. When out on walks, we are often stopped by strangers commenting on his good looks and friendly demeanor.” Jack is available for stud service to health-tested females from approved breeding programs. A little about Hudson: Gail's Handsome Hudson has the privilege of living with a dog-loving family! They have 5 large dogs total, three of them goldendoodles from Gail's Doodles! They say, "Hudson is a wonderful, young ‘All American’ male pooch who loves playing with his 1/2 sister April and his mother, Autumn. He is always happy, and his energy level is just right for an active family; he LOVES his walks and playing King of the Hill with his 4 canine siblings! That being said, Hudson also loves lying at our feet and filling in as a pillow for our two sons. Hudson is the perfect combination of his parents -- he has his mother's sweet temperament and this father's good looks. Hudson is a gentleman! His human father, Frank, is sure Hudson knows he is a special dog.” Frank says Hudson's prancing steps and bouncing coat are proof positive!" Thank you, Maguirk family! Hudson is available for stud service to health-tested females from approved breeding programs. A little about Ollie: Gail's Outstanding Ollie is our gorgeous red Medium F1B Goldendoodle. He is one of the most easy-going and mellow dogs you will ever meet. In fact, his adoring Guardian home describes him as her loveable rag doll, and says his "favorite move" is to give her a big hug with one paw on each of her shoulders! Ollie weighs 38 lbs. and is 18" at the shoulder. He sailed through his health testing. Ollie hips rated in the 90+% with PennHip (meaning his hips are in the top 10% of all goldendoodles) and have an OFA Good Prelim. score. His Elbows are OFA Normal and his eyes are OFA clear. Ollie is available for stud service to health tested females from approved breeding programs.